What is the future of the Green/NDP marriage? Are we fated to decades of reminders about capitalism’s inherent corruption blended with reminders of mankind’s pending fate on the BBQ? Or, will this odd couple evolve, much as aging hipsters, and turn into boring persons worried about the mortgage? So far, the marriage is showing surprising resilience. Few of my acquaintances would predict early breakup. Of course, having full-time taxpayer-funded marriage counsellors helps. The leader of the Green Party is clearly having the time of his life, jumping to his feet to take pot shots at the party of the Left from time to time, just to prove his standalone virility. The NDP Party has displayed admirable restraint, although only their dentists could reveal how far their molars have been worn down in the process. Both recognize that for better or worse, they depend on each other and – at least for now – this augurs well for a mutually tolerant relationship, although whether companionship extends to bed privileges is doubtful. On our side of the house, former powerful cabinet members are learning how to do things that were previously done for them by others, and appear to enjoy it, while the newly elected talent – and there is ample supply of the truly special –has been occupied so far with learning the ropes. Long-time backbenchers, such as myself, find it is mostly more of the same, but easier. It is always easier to criticize. In the intermediate term, the challenge will be to keep everybody challenged. And of course, we do not know how the leadership contest will play out – and this is key. Having taught management and studied leaders high and low in many situations for many years – I recently added up the number of paying jobs I have had but stopped counting at 20 – I have to come to recognize and admire how truly complex and subtle is the job of political leadership. As a result, you may have noticed, tenures in the corner office seem to be shortening. But as Christy emphasized, without success, the present situation is quite unstable and unpredictable. Votes are won by margins of one or two. All that it takes is one recalcitrant backbencher or two, and the whole edifice comes tumbling down. Illness or accident would also suffice. Do not expect mercy if an airplane breaks down on the tarmac and prevents a member from appearing for a confidence vote when the division bells ring. The NDP keeps the Greens in line with the vision of their promised land: proportional representation assuring the Greens satrapy forever. With such a niche secured, and with parallel destabilizing niches in prospect, the possibilities of their exerting power and influence over the masses, are endless. The NDP is cleverly pushing out the final resolution of such affairs at least until 2021. The Greens keep the NDP in line with their support on money bills, but only so long as the Greens hold the balance of power. This is a thinner mathematical probability. If the NDP senses the public concludes they are not Marxist mis-managers after all, and if they believe their free-enterprise opponents (us) are in disarray, they will be tempted to call an early election and seal the Greens’ fate. It is not clear to me – nor to their sage Bill Tieleman – that proportional representation will work to NDP advantage. But the NDP wobbles on the issue of whether they can achieve the nirvana of an absolute majority. Thus, for now, the Green position is relatively secure. And what does it mean for us, Her Majesty’s Loyal Opposition? Well, we have been handed a huge menu of opportunities. There are so many dubious and unaffordable political promises in the NDP’s baggage train, the pickings are easy. As public resentments over our own conjured misgivings fade away, and the characteristic faults of NDP governments throughout history re-assert themselves, it is possible the Green-NDP marriage could be headed for divorce court quite soon. But brace yourself for their REALLY hard sell about proportional representation. Making every vote count, and all that—I hope British Columbians see through it. I am on a quest to save the steelhead. We are perilously close to the extinction of this iconic fish in southern BC waters. They are famous in the fraternity of catch-and-release rod and reel anglers around the world. Its probable extirpation upsets me and should upset all British Columbians. Steelhead are beautiful and powerful, weighing in at 30 pounds or beyond, capable of swimming up rocky rapids that defeat ordinary salmon. Steelhead are in fact muscular over-sized and seagoing rainbow trout, somewhat fussy and unpredictable, and longer-lived. They spend most of their adult life in the ocean, returning to spawn in our fast, clean fresh waters, sometimes repetitively. Steelhead and I go back together a few years. The accompanying grainy black and white photos were taken pre-WWII on the Coquihalla River, a tributary of the Fraser. They show our friends, the Nordgren’s, Norwegian immigrants living at Othello on the Kettle Valley Railroad. Here, a series of railway tunnels created obstacles in a canyon gorge where huge steelhead rested in pools and could be caught. I recall climbing down into the canyon on a rope to fish for them. 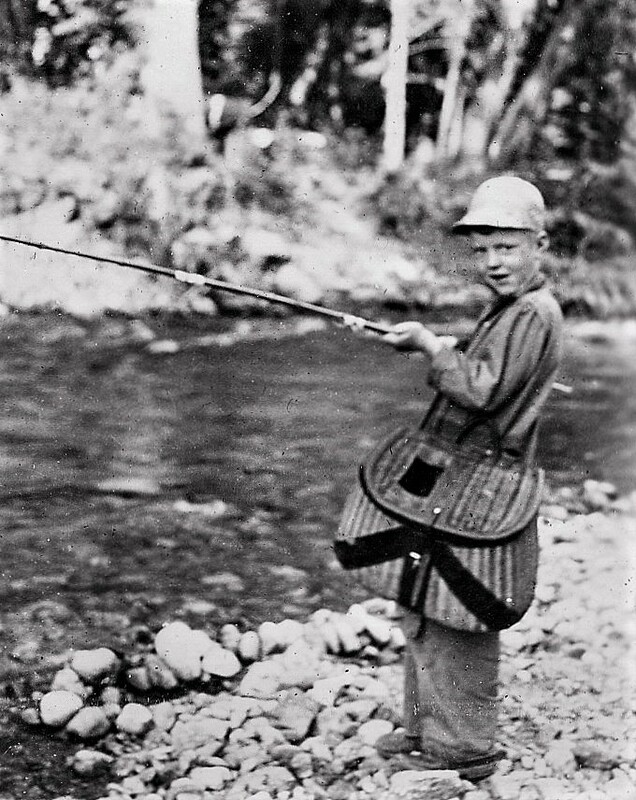 A second photograph shows me, age about 6, fishing for juvenile steelhead on Nicolum Creek, a tributary nearby. Nowadays, fishing in what has become Othello Tunnels Park is forbidden. 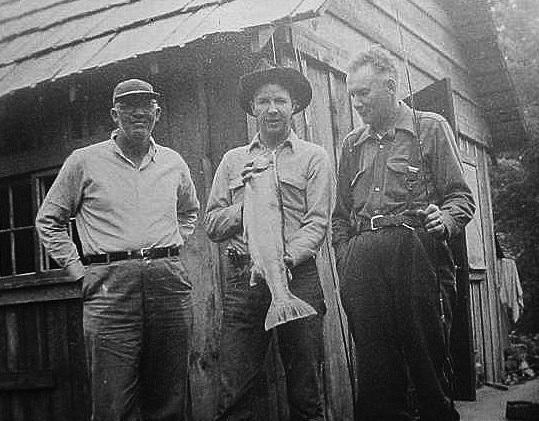 Steelhead monitoring only began in 1978. We count them one by one, believe it or not, in the water, wearing a snorkel and a wetsuit. I participated in one such adventurous swim of the Coquihalla above the gorge, organized by our Minister of Environment. The Thompson and Chilcotin watersheds have been home to our largest southern population. In 1989, returning Thompson River steelhead numbered over 7,000, and Chilko River steelhead, as many as 5,000. But today only a handful return to spawn — a mere 430 on the Thompson in 2016, and on the Chilko, only 134 last year. This year’s outlook is even worse — about 165 for the Thompson and only 50 for the Chilcotin. Extinction of the gene pool looms on our watch. 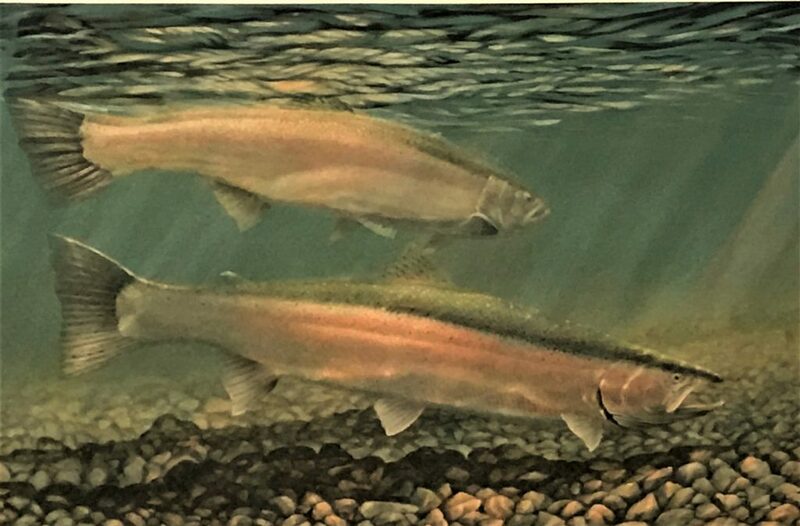 Steelhead are in trouble for several reasons including absentee management from Ottawa – since as an ocean-going species, steelhead are a Federal Government responsibility. But Mother Nature also plays a dominating hand. Physical blockages. MLA (North Vancouver-Seymour) Jane Thornethwaite lobbied for the removal of a rock slide on the Seymour, blocking returning steelhead. MLA Jackie Tegart (Fraser Nicola) lobbied for the removal of a huge barrier that fell into the Coquihalla at the Tunnels Gorge. Under the guidance of Seymour Salmonid Society’s Shaun Hollingsworth, both physical barriers are being gently removed over time. Global warming. A blob of warm water circulating around the Pacific has disrupted the ecosystem. Southern predators are ranging northward, snacking on our salmonid. Habitat destruction. In the past, the provincial government assisted such groups as B.C. Wildlife Federation, the B.C. Federation of Drift Fishers, the B.C. Federation of Fly Fishers and the Steelhead Society of B.C. in collecting donations from forestry companies and others which was used to pay for the bolting of artificial debris to the bottom of such streams as the fast-flowing Silver Creek outside Hope. Thoughtless logging can destroy trout streams. Hatchery fish befuddlement. Volunteers on the North Shore raise steelhead, which are released at the mouth of the Seymour, but most don’t get as far as Point Atkinson. Being raised in the comfort of the hatchery doesn’t seem to give them the instincts to survive in the wild, and the seals eat them for breakfast. In my view, the most irresponsible factor currently destroying this species is regulatory, coming out of Ottawa. It is the commercial salmon fishing bycatch. On October 24 of this year, DFO thoughtlessly opened commercial gill-net fishing for Fraser River chum salmon. Low-value chum are the only species still abundant enough to sustain a commercial fishery on the Fraser. It’s small and dominated by First Nations. This chum gillnet harvest coincides with the Thompson and Chilko rivers migratory steelhead return. Experts estimate that as many as 50 percent of the Thompson- and Chilcotin-bound steelhead are intercepted as bycatch in the commercial net fishing. Few steelhead survive an encounter with gill nets. DFO is well aware of the plight of the steelhead but continues to approve and support the commercial net fishery of chum salmon. It has been a problem talked about for years. The feds came up with a solution: the so-called Jesus box. If you catch a steelhead, you’re asked to put it into a cooled wooden box, the Jesus box, where it will miraculously come back to life. It is said that most of the steelhead were resuscitated right onto the dinner table. Ottawa is full of ideas. So what should we do? Three things: (1) adequate funding for a science-based recovery program; (2) enhanced river guardian programs with First Nations, particularly engaging those in river mouth gillnetting; (3) suspend the gillnetting of any species when our few remaining steelhead are running and switch to kinder options, such as the fish wheel and seining. BC Liberal MLA’s have not been inactive on this file. We have, for a number of years, had the Steelhead Caucus, which I co-chair alongside Jackie Tegart, MLA Fraser-Nicola where the Spences Bridge steelhead fishery still brings in the tourist dollars. Other members of the caucus include the members for West Vancouver–Sea to Sky, North Vancouver–Seymour, Cariboo–Chilcotin, Cariboo North, Richmond–Steveston, Delta South, Kamloops–North Thompson, Richmond–Queensborough, and others. Several years ago I organized the Steelhead Summit, bringing together experts and advocates. Perhaps it is time for Steelhead Summit II. While there is much we can do to restrain irresponsible killing of steelhead in the commercial fisheries, there’s not much we can do about the great mysteries of the steelhead once they travel into the vast Pacific Ocean. We can congratulate the federal government for contracting to build the large and sophisticated deep-sea research vessel, Franklin, at Seaspan’s Vancouver Shipyards on the North Shore. This amazingly large and complex vessel, when deployed, will hopefully come up with better answers to what is happening to our salmonids in the Pacific. We can invest in science and knowledge. We can improve the habitat. We can control the timing of fishery openings. We can control the fishing methods and encourage the use of friendlier seining and fish wheel approaches. We can take action. Some of these decisions are made by distant DFO decision-makers in Ottawa. On the floor of the Legislature, I have asked famous British Columbian Margaret, to please order her son, the Prime Minister, to save the steelhead. If we lose them, history will not be kind to us. Maybe We Should Change How We Choose a Government? Why politicians should simply stay out of electoral redesign is obvious when we see what is happening today: a government that believes it has a lock on impartiality (when deciding issues of great partiality) has devised a 3-pack of clever legislation designed to further its own interests, setting before us laws that discriminate in favour of itself, maximize its probability of rule, and overlook no corner of partisan advantage. The Legislature was asked to approve a new system of choosing MLA’s under the label of proportional representation. The specifics are undefined. The Green-NDP coalition simply says, “Trust Us!” Whether we trust them or not, the coalition have the votes to make the changes they have chosen. The bill passed. Along with a bill charging BC taxpayers for the campaign expenses of the various political parties. These changes are now law. There will be a referendum. The ballot will rely on the uncertain performance of a struggling Canada Post, and be conditional on a pitifully low approval hurdle: 50 percent plus one. Several options will be put on the table, with a winner chosen by ranked ballot, with second choices of losing options redistributed to survivors and so on. We are all familiar with that voting system. If there is only one first-past-the-post (FPTP) option (our current system of choosing MLAs), and more than one proportional representation option on the ballot, you can do the arithmetic. The fix is in. A multiple choice referendum will not favour FPTP. As political pundit Keith Baldrey has already pointed out, given multiple choices rather than a binary choice, the chance that First Past the Post receives 50 percent plus one, is minimal. So sorry, FPTP, you got your chance at bat but you struck out. We are left with our private speculations as to where the government will go next. I believe we can make a reasonable prediction of the system the government will advance. It will be MMP. It can give extreme parties a foothold in Parliament, and the Weimar Republic and the Bundestag have been cited as examples. Negotiating backroom deals replaces public debate. If necessary, taxpayer-paid secretariats may be appointed to broker ongoing trade-offs far from the prying media eyes or political scrutiny. Hostage taking can occur, when a leading party is close but oh so far, and cannot form a majority without bending to the will of minority interests on issues contrary to its own election platform and principles. Principles fly out the window in the quest to form a government. Accountability suffers. PR coalitions obscure who’s in charge, and make it more difficult to hold individual factions to account. Some parties develop nine lives in governing coalitions under PR, even as they evolve into zombie organizations whose most important support is taxpayer funding, regardless of electoral performance. Think Parti Quebecois in Ottawa. The present configuration of rural versus big-city representation would certainly be turned on its head. Odds favour the big-city coalition. Since the NDP’s political base is concentrated in non-rural areas, the government will assuredly skew voting influence in that direction. Needless to say, I am not a big booster of this model of proportional representation – but it stands a good chance of becoming the basis of choosing who gets to go to the Legislature in British Columbia. It is hard to conceive how any system of candidate choice based upon Party rather than Citizen can be considered democratic. The inner machinery of a Party is seldom transparent. Party lists would no doubt tend to be built inside the club, based on party service and loyalty, the trading of future favours, and personal alliances – not necessarily in sync with the views of what the public thinks desirable. It is no accident that some parties get excited over the possibility of moving to MMP. Lips are smacking. We have been targeted by a series of housing announcements impacting Vancouver and the North Shore. Let’s add them up: 114,000 new affordable dwelling units — a key election promise of the NDP only 6 months ago; 100,000 more houses (also affordable) promised by Justin Trudeau in Ottawa (with lots of caveats but Vancouver is surely on his priority list); 72,000 housing units promised by Mayor Gregor Robertson for renters, families and the vulnerable. These three numbers sum to 286,000 affordable housing units — approximately the total number of existing dwelling units in the City of Vancouver. So, depending on where Justin spends his money and adding a few new homes for folks like you and me (which does NOT seem to be what the above announcements were all about) then we could easily be setting out to replicate the entire City of Vancouver in the coming decade. I am not sure where this twin city will be located, but I marvel that we of the political class are so facile when putting roofs over citizens’ heads. I am tempted to go into BC Liberal Caucus at my earliest opportunity and suggest we cannot be left behind. We should raise the ante and promise at least another 100,000 dwelling units of our own – sometime, somewhere between Point Grey and Spuzzum. Promises you can rely on. By the way, the NDP’s housing promise will double the provincial debt. To deduce supply we must take into account at least ten variables: profitability; zoning; density; building codes; neighborhood consultation; costs and pricing; public housing versus private housing styles; the mix of high-rise vs lo-rise vs row housing and duplex; the availability of transportation infrastructure; and the mortgage policies of agencies under the thumb of the Bank of Canada. Let’s forecast them, manage them, and channel the forces of supply toward our optimal goal. On the demand side another ten variables demand our attention: the macroeconomic climate; shifting neighbourhood character; immigration and offshore owners; population age distribution and demographics; the available market of retired vs. locally working vs commuters vs students; the magnitude of the mass market versus the needs of the homeless; short-term vacation rentals like Airbnb; ease of transportation; and taxation by all levels of government plus don’t forget Metro’s vision for the future and the small matter of affordability. Once you have deciphered all of that you can then try to learn from the mistakes and successes of others, such as Auckland, New Zealand. New Zealand’s population is 4.6 million, and Auckland’s is 1.5 million, placing them in the same approximate size range as British Columbia and Vancouver. Auckland too is overhung by a much larger neighbour (the Aussies) and a dominating Pacific trading partner (China). It is a beautiful city by the sea which takes the quality of life and environment seriously. Bloomberg reports it is one of the least affordable cities in the world, after Hong Kong, Sydney, and Vancouver. Does this all sound familiar? Auckland needs to embrace its growth potential or it will choke on its own success. Auckland needs to grow both up and out and we need more intelligent ways of financing infrastructure. If we want a lasting solution to this problem, we (must) allow the market to deliver better outcomes on its own. We’re going to build affordable houses. We’re going to tax speculators. We’re going to do all of those things, right? This government is committed to making life better for tenants. Reduce the potential for speculation and land banking. Allow low-impact granny flats, small backyard tiny houses etc. to pick up the slack. The crazy Auckland property market needs reining in. Capital gains tax as a way of controlling house prices doesn’t work overseas, but what about a land tax? There is an increasingly difficult challenge for first home buyers to actually afford a home. There are many reasons why Auckland property is increasing in price. The most important is population pressure. Migrants are more likely to settle in Auckland than anywhere else. There is also a continuing trend of New Zealanders shifting to Auckland for opportunity. That is what larger cities provide. The Reserve Bank Governor thinks Auckland house prices are a problem but is unlikely to increase interest rates—one of the key drivers of price increases. Cheap money certainly boosts demand for housing. In my lifetime mortgage rates have never been lower. Can tax policy play a part? The government has already reduced the ability to deduct depreciation. But they have other tools: eliminating the deduction for interest, re-introducing land tax (abolished in 1988), and introducing a capital gains tax. Why is Auckland so popular now? The jobs are there. It’s New Zealand’s most “global” city. It’s also a beautiful city. Auckland also attracts New Zealanders wanting to experience a little of the glamour of an international city without having to relocate to Sydney, London or Singapore. For minority ethnic groups, Auckland is big enough to have a vibrant and diverse dining, arts and culture scene. Immigration to New Zealand is at record highs meaning more homes are needed – fast. So who owns these properties? Increasingly, not New Zealanders. Foreign investment in Auckland has boomed. According to Core Logic in 2012, 37% of buyers were investors. Today that proportion is nearly 50%, a significant number of whom are from China. It’s not been called a “crisis” lightly. Just before winter, stories emerged of hundreds of people living in tents, garages and shipping containers. Families with newborns were discovered sleeping in cars and under bridges and were taken in by local ‘maraes’ (Maori meeting houses). Homelessness has reached an unprecedented level and it’s no longer affecting just the unemployed. Some families with one or two wage-earning adults are unable to afford a roof over their head. Garages with no toilet or cooking facilities are being advertised on ‘Trade Me’ for NZ$500 per month. For young professionals and people wanting to start a family, home ownership is becoming an impossible dream. New Zealand’s central bank imposed strict new deposit requirements in July, making investors put down at least 40% of the purchase price in cash, which has gone some way to cooling the market. The government has offered people on the social housing register cash incentives (up to NZ$5,000) to move to the (rural) regions. So far 12 people have taken up that offer. New Zealand’s newly elected government is launching an attack against foreign home ownership. The plan, as outlined by the Prime Minister, will ban non-residents from purchasing existing homes in the hopes of curtailing real estate prices. David Ley, another UBC professor, says the lack of government control over foreign real estate investment in Vancouver is surprising, because other cities that have a large amount of foreign ownership have measures to control soaring housing prices. It seems he endorses foreign ownership controls. Urban Development Institute CEO Anne McMullin (former president of the North Vancouver Chamber of Commerce), says Metro Vancouver municipalities’ failure to convert single-family zoned neighbourhoods into areas where developers can build multi-family homes is one obvious solution, pointing out that the supply of completed new condominiums and town homes has fallen substantially during the past five years. Candidate for BC Liberal Party leadership, Mike de Jong, points out 120,000 housing unit construction applications are in various Metro Vancouver queues, some having been there for years. His solution is to require a decision – any decision – on the part of the individual municipalities involved, all 22 of them, within 10 months. Paul Kershaw is a demographer at the UBC School of Population and Public Health who believes BC is the worst performing economy in Canada for younger generations, due to the fact that they are squeezed by stagnant incomes, difficulty in finding good jobs, high student debt and high costs for things like housing. He asserts the primary driver of households’ net wealth is climbing housing prices, in this regard Canadians under 44 being large losers – forced into debt — and Canadians over 55 huge gainers – effortlessly enjoying a rising tide of home prices. Housing is the generational tipping point. Rebalancing government programs will help “generation squeeze” afford housing that is otherwise, unaffordable. The solution, says Kershaw, comes in multiple forms: allowing more dense and varied housing to ease the supply shortage, which could push prices down, and taxing wealthy oldsters so that over-leveraged young people aren’t paying the same taxes as boomers who are debt-free. Kershaw also mentions foreign money, an issue that has dominated much of the debate around rising real-estate prices in Vancouver. “When in doubt raise taxes” is the Green-NDP default solution for much which ails us – based on their pre-election pronouncements. The Official Leader of the Green Party said if he was in power (and in many ways he is!) he would raise the foreign purchaser tax, and the high-value-home property transfer tax, to a total of 42 percent. That, he appears to believe, is the level of shock treatment necessary to halt the inflation in house prices which is damaging affordability. So, for example, if somebody from Chengdu, China purchased a house in West Vancouver for $5 million, they would be required to add $2.1 million to the purchase price and the seller (I guess) would be obliged to send that additional $2.1 million to Victoria. Total house price: $7.1 million. Of course, unconsidered was the possibility that the sudden upward shift in the net price of very high-end homes, might help uplift the prices of those bargain $1 million homes in our community. Or, the possibility that the buyer might go back to Chengdu and invest his or her capital elsewhere. Which was perhaps the true intent of the Green-NDP partnership now governing the province. Any housing plan or strategy recommended for the North Shore must recognize the unique housing profile of the independent municipalities which constitute the North Shore. 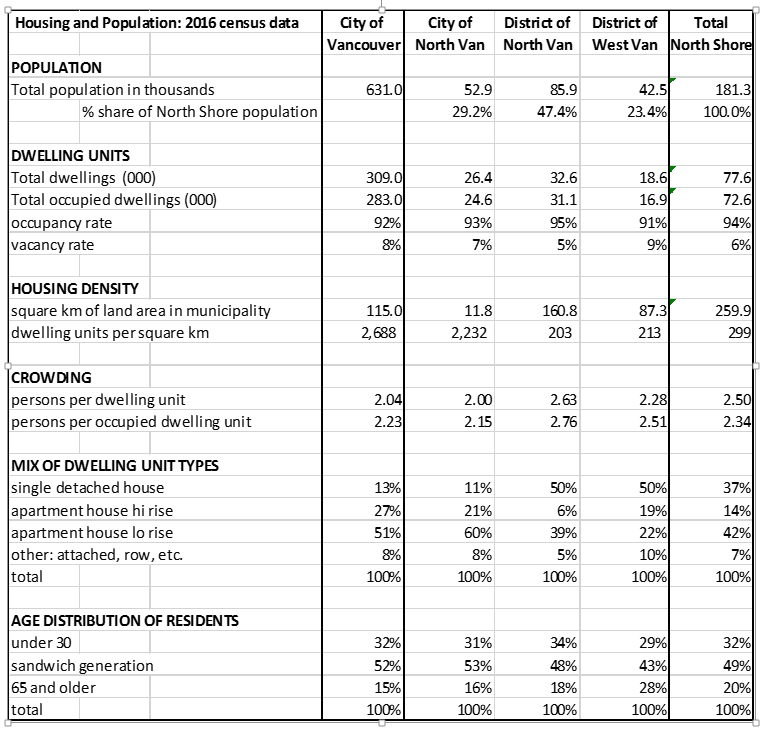 As we consider North Shore dwelling units, five questions should be answered: About how many? What type? Where? What price range? And what target market? – And tie that final answer into transportation. The recent growth in population on the North Shore has been about 0.8% per annum – significantly slower than the larger Vancouver area from Chilliwack to Whistler which has recently been growing a lot faster (1.3%). Let’s assume geography, transportation, and community preferences keep it that way. And note that on the North Shore, vibrant West Van’s population is not growing and in some years actually shrank! Looking out to 2050, if present growth continues, the North Shore may add between 50,000 and 60,000 persons to its population, which works out to new demand for about 1,600 dwellling units each year. If North Shore town planners want to reduce the scarcity factor, add maybe one-third to those supply goal numbers. It seems to me most probable that the mix of dwelling units will shift over time, with DNV slowly adjusting in the direction of CNV in the proportion of apartment buildings in its dwelling inventory. WV will in likelihood follow DNV in this regard, but more slowly – partly due to its slower over-all increase in dwelling units built. The transformation of the North Shore away from its prior focus on single family dwellings is most obvious in CNV, which with higher growth will probably increase its share of the North Shore dwelling inventory in the longer term. Again, with resistant forces often at play, WV may display the slowest over-all growth in dwelling units, but will also, I believe, be characterized by a significant de-emphasis of the single detached home. It is difficult to envisage a North Shore with a large proportion of “affordable” housing, as its physical and natural attractions and adjacency to a high concentration of higher-paying jobs, discourages lower-cost housing – unless deliberately created by local governments as an instrument of social policy. It seems to me that aided by the provincial government cash and policies, local governments can and must do exactly that. Target market — tied into transportation? I believe an important shift in attitudes and policy is now taking place with respect to housing for the extreme upper end which has until now been an open inducement to foreign capital seeking investment return, anonymity, casual tax enforcement, and security. In reaction to the resulting pockets of “zombie” neighbourhoods now extant, with few permanent residents and often unkempt empty houses, housing policy at all three levels of government (federal, provincial, local) will, it seems to me, change the rules so that the future will not see such a large penetration of the North Shore housing market by passive investment from non-residents. Our three local municipal councils on the North Shore should modify their zoning and permitting to discourage the proliferation of massive luxury homes aimed at the offshore market. As for the issue of affordability for those who work but cannot afford to live here, the obvious solution is a necessary massive long-term investment in public transit so that persons can commute to and transit through the North Shore without exasperating delay and waste of valuable time. I suggest a commuting time objective for public transit. Even at peak hours, commute times from place of residence to the North Shore for 85% of commuters, should not exceed 40 minutes each way, for total daily commuting hours slightly in excess of one hour from even remote communities. Notes: What does this Table say? NV District holds about half of the NS population, NV City next, WV the least.